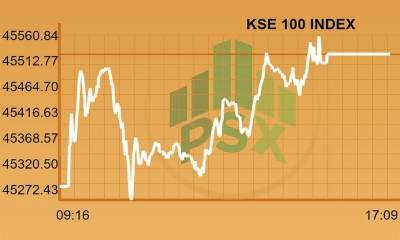 Karachi (Staff Report): The Pakistan Stock Exchange (PSX) on Thursday closed in the red as the benchmark KSE-100 index shed 365 points, or 0.79 per cent, to close at 45,634 points. The index crossed the 46,000 points mark early in the session to touch 46,213 but lost ground to hit a low of 45,572 towards the day's close. Commercial banks dominated the day's trading with 21.2 million shares traded while engineering and oil and gas companies followed with 17.4 million and 15.4m shares traded respectively. Nearly 74.5 million shares worth Rs 6.57 billion were traded in the day. Shares of a total of 362 companies were traded in the session, of which 84 gained in value, 255 declined and 23 remained unchanged.